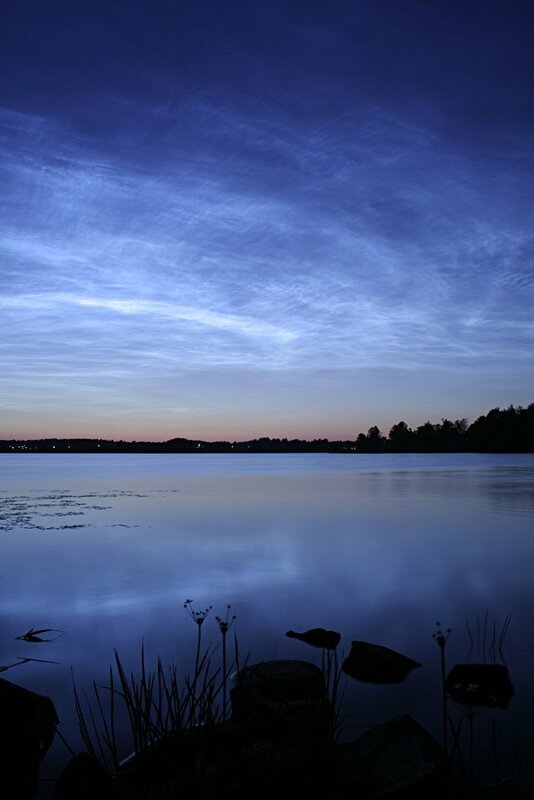 Observing tips: Look west 30 to 60 minutes after sunset when the Sun has dipped 6o to 16o below the horizon. 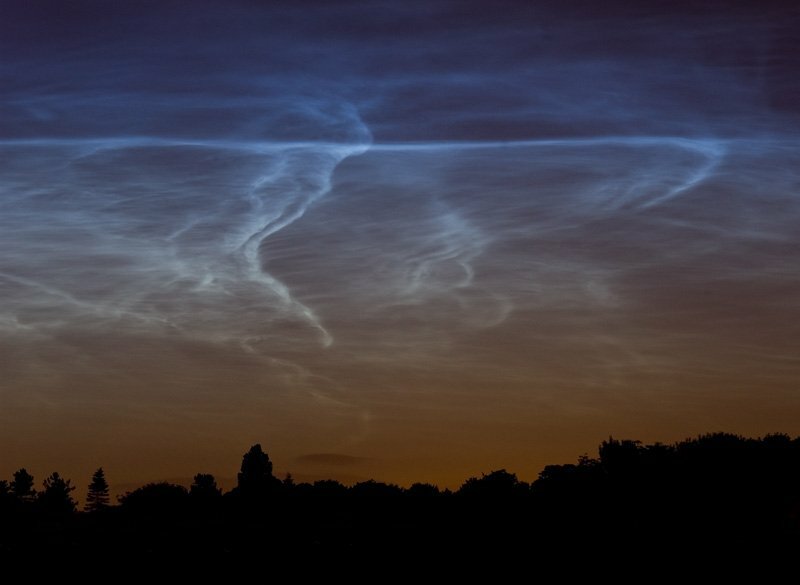 If you see luminous blue-white tendrils spreading across the sky, you've probably spotted a noctilucent cloud. 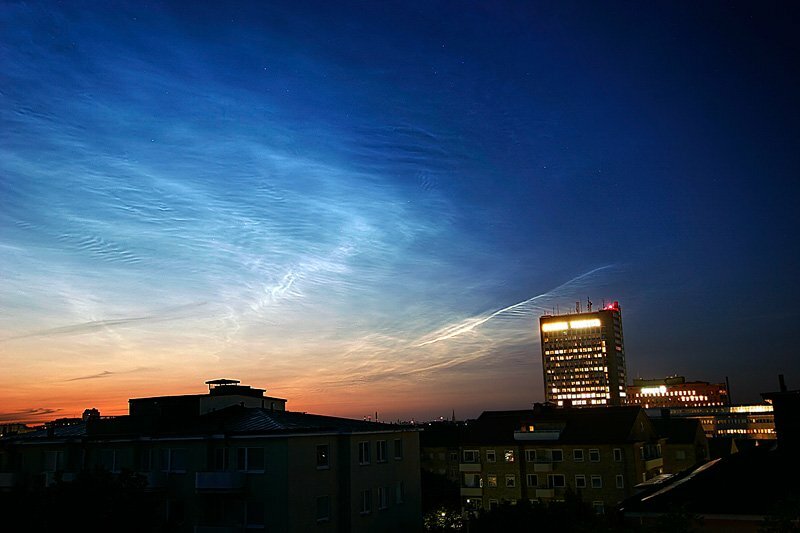 Although noctilucent clouds appear most often at high latitudes such as Scandinavia and Canada, they have been sighted in recent years as far south as Colorado, Utah and Virginia. 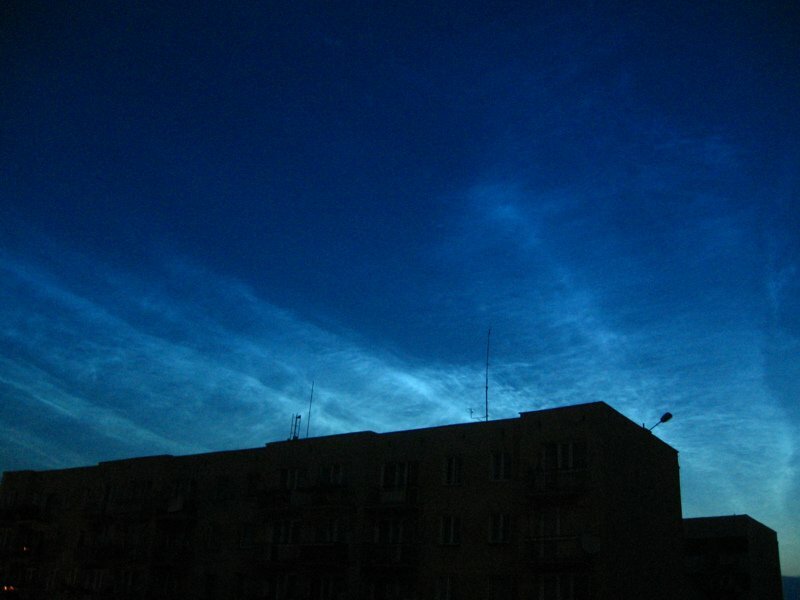 NLCs are seasonal, appearing most often in late spring and summer. In the northern hemisphere, the best time to look would be between mid-May and the end of August. See also 2003, 2004 and 2005. 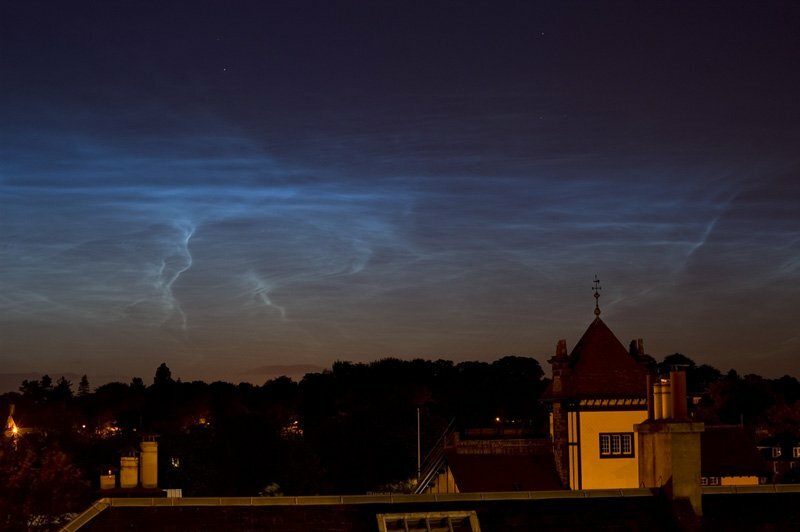 Very bright noctilucent clouds. Looked like full moon behind the clouds. Bright enough for the notoriously poor low light auto focus of my Olympus 8080 to work (it usually can't get a focus lock on a full moon). Looking north. 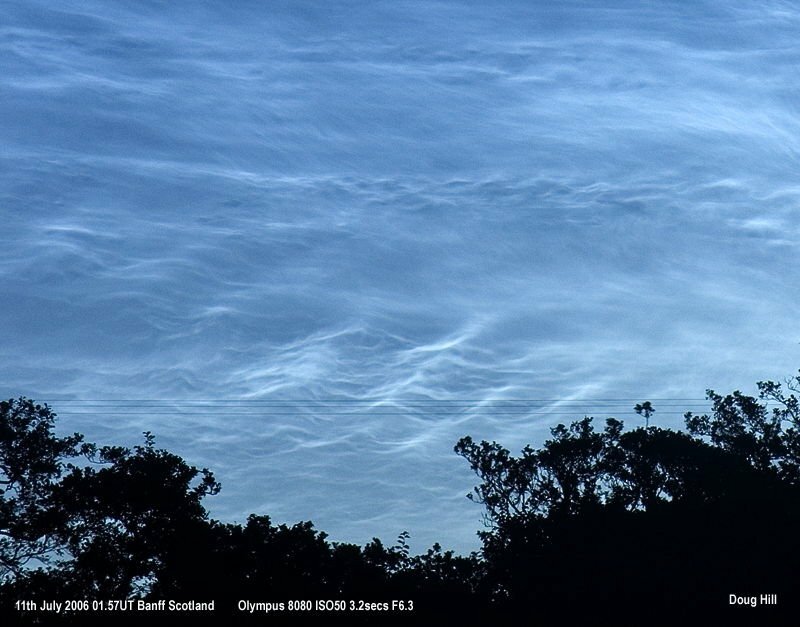 A fantastic Noctilucent cloud display, very strong with different shapes and structures. I captured these photos with my Canon DSLR. Photo details: Canon 20D with 17-40mm and 70-200mm lenses. 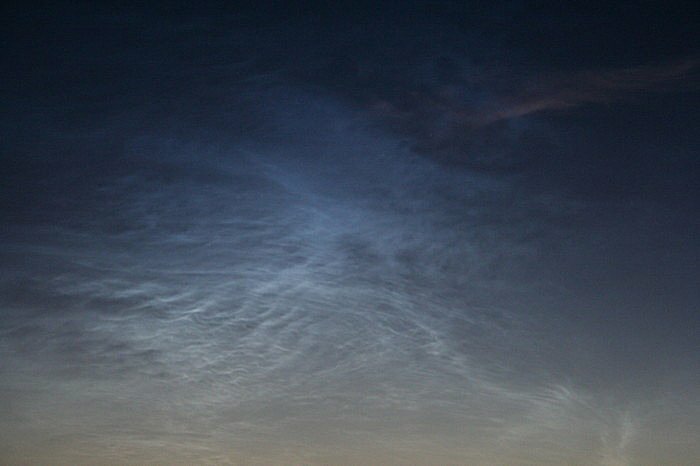 I saw these bright clouds while waiting for very bright Iridium flare (about -8 mag). Too bad I couldn't go out to find better place to take photos. The display lasted for only 1 hour. Photo details: Canon PowerShot A520, ISO 200, 3 to 1s exposure. The clouds were bright enough to see them right out from the computer room located below the observatory dome. Photo details: 30s exposures at ISO 100. Photo details: Canon EOS 20D, 10-22 zoom at 22mm, 10 secs at f/4.5. 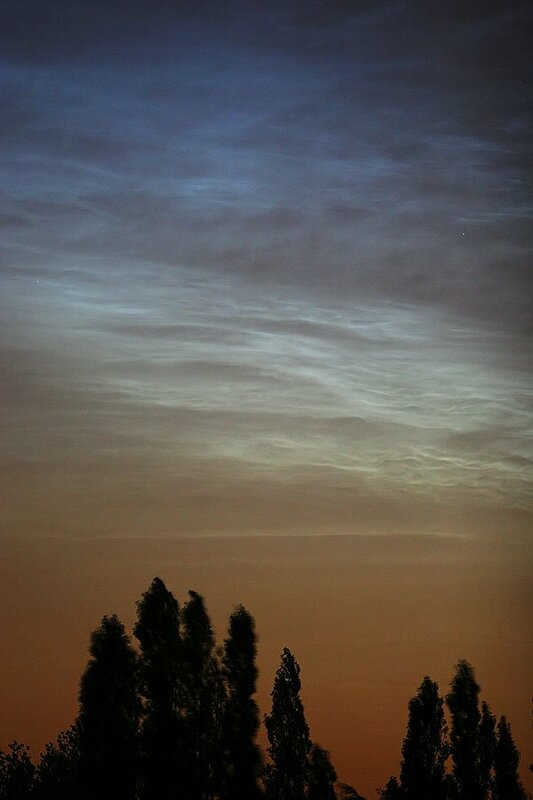 Fantastic NLC display, this is the best I've ever seen, just wonderful! This NLC display was the biggest I have ever seen in my life! 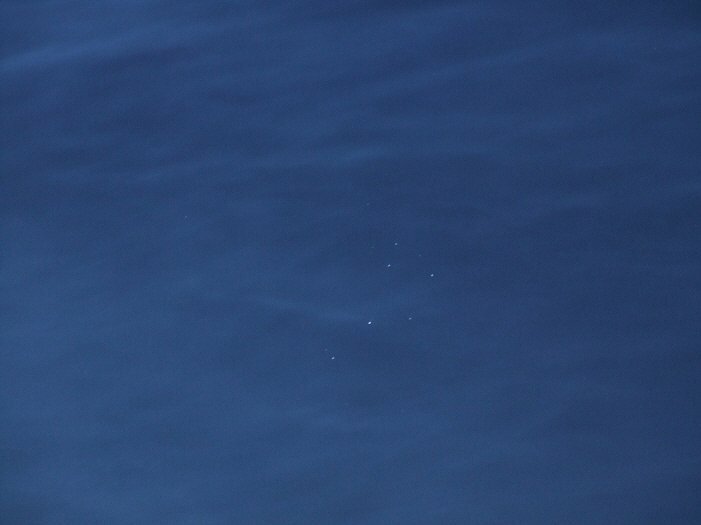 They climbed rapidly over head, showing no respect for the zenith until they were 160* high and in the SE near the moon. 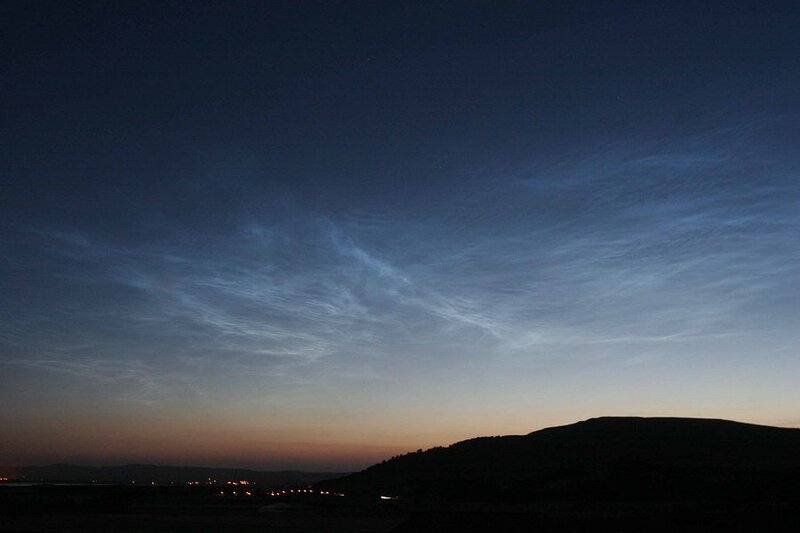 The 7 sisters were an exqusite sight against a background of undulating NLC blue velvet. At one stage I could see the shape of two silver stallions galloping side by side..unforgettable! 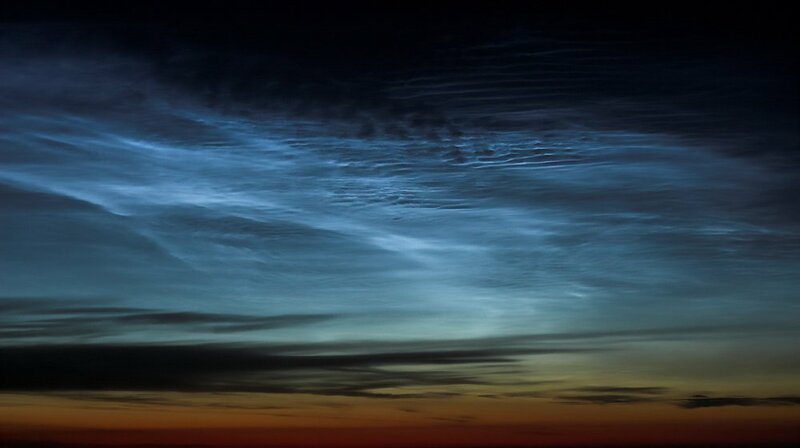 My first real look at noctilucent clouds. Very impressive. 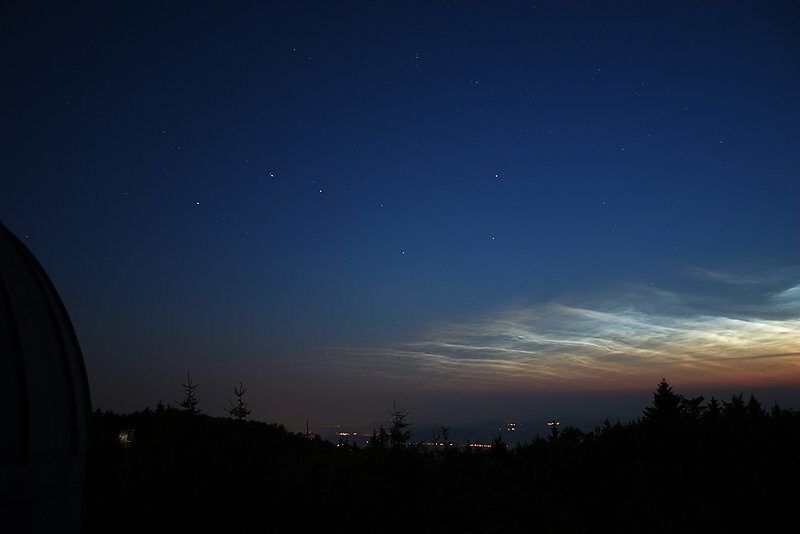 Very bright NLC display in The Netherlands. Panorama was made from 6 photos. Photo details: 10 sec exposure, f/5.6, 400 ASA. 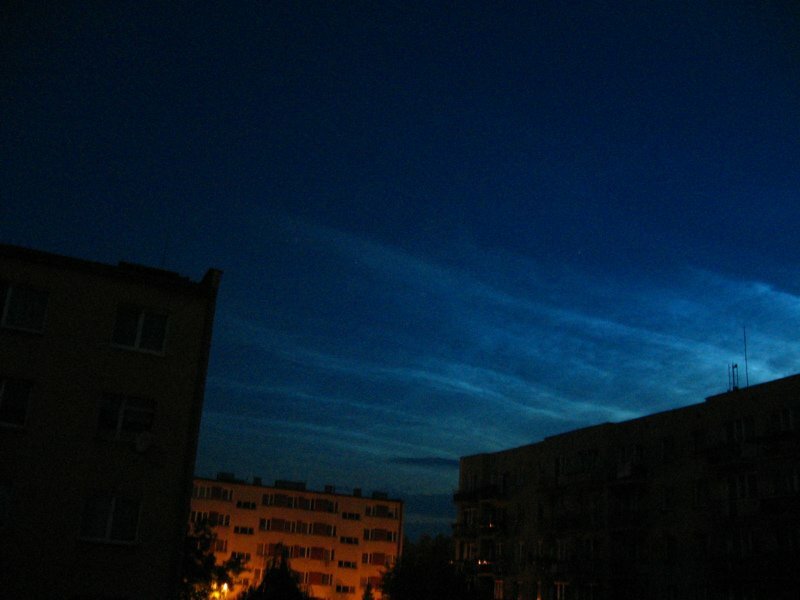 The Noctilunent clouds were moving faster than I have usually seen them and remained visible for a short time after the sun went down. This picture was taken just before Midnight BST. Photo details: Canon EOS 20D and a 15 30mm lens at ASA 800.